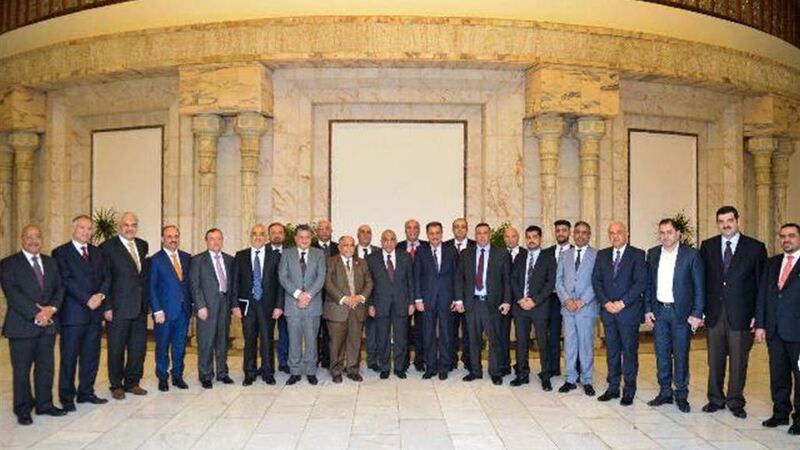 Prime Minister Adel Abdul-Mahdi on Wednesday discussed with a large delegation of Iraqi investors and businessmen the support of the private sector's contribution to the expansion of economic activity and state-building, challenges facing their work and ways to overcome them. A statement from the office of Abdul Mahdi and received by "Al-Gharad Press" that "he stressed during his meeting with the delegation of investors, that with each work serves the participation of the private sector in all areas, and we are familiar with the work of the private sector and the challenges facing it. He pointed out that "the successful experiences of the industrial countries that adopted the market economies for the development of their public and private sectors alike, stressing the approach of the government to seek not to take any decision on the interests of this sector in all segments without consultation and involve those involved in the resolution and listen directly to them to come up with resolutions and solutions to all issues" . During the meeting, they discussed several issues related to the work of the private sector and the proposed solutions needed. confirmed Prime Minister Adel Abdul - Mahdi, Wednesday, to businessmen and investors , Iraqi support for the participation of the private sector in all areas, while noting that it is wrong to consider this sector attached to the state. The press office of Abdul-Mahdi, in a statement received by Alsumaria News, a copy of it, the latter "received today, a large delegation of investors and Iraqi businessmen," noting that "discussed with them support the contribution of the private sector to expand economic activity and state building, and challenges facing their work and ways Remove them ". "We are aware of the work of the private sector and the challenges it faces and it is wrong to consider it as an annex to the state," he said. He pointed out that "the successful experiences of the industrialized countries that adopted the market economies for the development of their public and private sectors alike," stressing "the approach of the government to seek not to take any decision on the interests of this sector in all its segments without consultation and involvement of those involved in the resolution and listen directly to them to come up with resolutions and solutions sound for all Issues ". The statement of the Information Office of the Prime Minister that "during the meeting discussed several issues related to the work of the private sector and provide solutions proposed and necessary for them." The ministry said that the agreement was signed in the presence of Minister of Commerce Dr. Mohammad Hashim Al-Ani, who stressed that the Ministry of Commerce works through the Department of Private Sector Development to find the supportive and encouraging environment for workers in the private and public sectors to enhance their abilities, skills and scientific and practical experience through setting up training programs in various economic and commercial fields. Systems and the use of modern technology. For his part, Director General of Private Sector Development Riyad Fakhir al-Hashemi said that this agreement will allow the two sides to establish workshops and courses free of charge and for one year from the start of signing the agreement and the establishment of the first training course for employees of the ministry or workers in the private sector and at least one session for two months To the company's activity through the site of the Iraqi International Trade Point and e-commerce magazine and the official website of the ministry as well as facilitate their participation in exhibitions held by the ministry inside Iraq with the preparation of the training halls of the Department of Trade Training Department or the halls of companies or J Chambers and associations. While the representative of Trainers Without Borders said that they are racing to achieve training and rehabilitation to develop the current reality of the country to keep up with the development at the regional and international level through programs and workshops to introduce the concepts of programs and modern systems. The signing of the agreement was attended by the Director General of the Legal Department, the Director General of the Department of Economic Relations in the Ministry, the President of the Federation of Chambers of Commerce and the President of the Federation of Iraqi Industries. Minister of Industry and Minerals, Saleh Abdullah Al-Jubouri, revealed on Thursday the establishment of a timetable and time schedules for the implementation of the Ministry's plans to conclude contracts of participation and investment to qualify and operate factories and diversify local production. In a statement received by Mawazine News, the ministry said that "Jubouri visited the General Company for Electrical and Electronic Industries accompanied by the ministry's advisor and general managers of the economic and investment departments. He held an extensive meeting with members of the board of directors and directors of factories and departments in the company. The company in the production of transformers, lamps, air conditioners, fans, furniture, etc. and the nature of its new projects and listen to a number of problems and obstacles to the work of the company and discuss many of the files and issues relating to contracts previously concluded. He stressed Jubouri, "the need to increase the confidence of the Iraqi citizen and state institutions of the national product and that the governing bodies are firm and strong in making decisions and take their active role in the conclusion of contracts of participation and investment with the companies financially and technically competent in implementation of the decision of the opinion body in the Ministry to grant board of directors in public companies Full freedom and authority to enter into contracts and partnerships that serve the industrial process and productivity. " He stressed that "the visits and tours field successive to come to identify the problems and obstacles that caused stagnation in the work of companies for the purpose of finding solutions and take the necessary recommendations thereon," noting that "it is important to give and reflect a clear image of the national product, The confidence of citizens and government institutions in light of the continued lack of cooperation of some ministries and state institutions to buy the local product. He pointed out that "the ministry has taken a decision in the opinion body, which gave the authority and the full freedom of the boards of directors in the companies to contract for the establishment of projects and new production lines to develop capabilities and develop the possibilities available," noting that "the direction of companies and their plans are consistent with the vision of the Ministry, And supervise the work of companies and reference to solve and solve the problems faced. The minister explained that "the ministry has set a timetable and timelines for the implementation of plans to conclude contracts of participation and investment to qualify and operate factories and diversify local production." The minister, according to the statement, "a field tour in the factories of the company and met with a number of staff to listen to their requests and the possibility of meeting them as he expressed many views and guidance to develop the performance of the company during the coming period."